A traffic officer has helped spread a bit of a joy across the roads by directing traffic with some funky dance moves. Dino Melaye's 'Ajekun Iya' meme gets a cartoon make-over and the senator happily shared on Instagram! Nollywood comic actors, the duo of Chinedu Ikedieze and Osita Iheme, popularly called, Aki and Pawpaw are currently in United Kingdom for their show, Aki and Pawpaw Live in UK. They are touring with fellow comedians like Elenu, Acapella, Youngest Oldman, AY. They were also hosted by Nigerian Footballer, Emmanuel Emenike in his London Home. Minister of Sports and Youth development, Barrister Solomon Dalung received Efe Ejeba, the Big Brother Naija Winner. The minister described Efe as an influential young person full of passion and determination, they discussed among many areas of collaboration to engage young talents across the country. The Nigerian-American rapper shared these adorable photos with his baby daughter Oluwakemi as they visited the Nickelodeon indoor amusement park in Bloomington, Minnesota. The South East Peoples Assembly, SEPA, has asked that Biafra agitator Nnamdi Kanu be sent back to prison. In a letter dated May 31 and signed by its President, Prince Chukwuemeka Okorie, the urged the Chief Judge of the high court, Justice Ibrahim Auta, to as a matter of urgency, revoke Kanu’s bail. According to SEPA, Nnamdi Kanu has continued to conduct himself in a manner that is totally at variance with terms and conditions of his bail, among which included that he must not hold rallies, grant interviews or be in a crowd of more than 10 people. Ryan Gosling might be busy with movies and awards but his Monday was spent in the company of his daughter Esmeralda. The doting father took his two-year-old daughter to the playground in LA on Memorial Day. A group of masquerades on Tuesday invaded a central mosque at Ikun Ekiti, a town under Moba LGA and beat up Muslims while breaking their fast. The Muslims had gathered to observe the Maghrib prayer after breaking their Ramadan fast around 7pm. Reports say the masqueraders were irked that the Muslims had the effrontery to call for prayers when they were still celebrating their Egun festival. They attacked the worshipers with cudgels, stone and iron and inflicted injuries on them. About five of the worshippers were said to have sustained varying degrees of injury. The Acting Imam of the mosque, Alh. Abdul-Rasak Abubakar-Bello, was rushed to the Ekiti State University Teaching Hospital, Ado Ekiti, where he received stitches on his head. He said the Muslims were held hostage in the mosque for four hours by the masqueraders, who threatened to kill them. “There was no way we could escape because they waiting for us outside after initially attacking us inside the mosque with iron and woody rods. Nicki Minaj, rapper Drake and rapper Lil Wayne at the Billboard Music Awards which took place on Sunday. Tboss shared some lovely photos as she poses in floral dress with a nice hat. Kourney Kardashian and her rumoured new beau, Younes Bendjima were photographed Sunday in an intimate pose, with Younes wrapping his arms around her from behind as they leaned against a barrier at the Hôtel du Cap-Eden-Roc on the French Riviera, not far from the 2017 Cannes Film Festival. Kourtney has reportedly been dating Younes for seven months now. Model, Kendall Jenner put on a show-stopping display in her Giambattista Valli Spring 2017 Couture gown which boasted an retro-inspired mini dress on top before the back flowed into an impressive train, as she stepped out for the 120 Beats per Minute premiere at the Palais des Festival. Bobrisky tells anyone who cares to know that he already belongs to someone rich. The 2017 Billboard Music Awards took place at the T-Mobile Arena in Las Vegas on Sunday night and Cameroonian singer, Dencia, who is known for her over the top red carpet outfits, did not fail to disappoint. Bisola had a get together with her family and friends over the weekend, and her besties; Efe, Marvis and Somaldina were all present to have fun and lit the atmosphere up. The mother of one and ex housemate of the Big Brother Naija show, Bisola Aiyeola is all shades of hotness in these new photoshoot. Efe Ejemba, the winner of Big Brother Naija reality show is the cover star for this week's edition of Thisday Style and he looks really gracious in the photos taken by Ty Bello. Ciara's son with Future, Future Jnr recently celebrated his birthday and had a Harlequin themed birthday party. Brazilian twin sisters, Maria Pignaton Pontin and Paulina Pignaton Pandolfi turned 100 years on Saturday, May 20, 2017, and decided to commemorate their milestone birthday with a colourful photoshoot. On Friday Mariah Carey was spotted on an intimate date with Bryan Tanaka, just one month after she split from the 34 year-old dancer. Looks like the relationship is back on after they were spotted kissing. Actress Keke Palmer who recently cut her hair really low, shows off her new hairstyle. Dr. Ogechi Obiano, the daughter of Anambra State Governor, Willie Obiano graduated from The University of Texas, UTHealth McGovern Medical School in Houston on Thursday, May 18th. A celebration was held in her honour on Saturday at Ayva Banquet Centre, Houston. Singer, Kelly Rowland was one of the guests at Beyoncé's Push Through Party which took place yesterday. She attended the event with her son Titan. 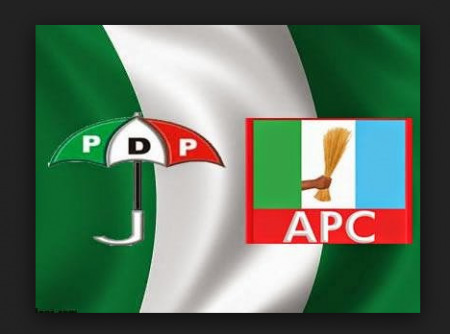 Chief Joe Mmamel, a chieftain of the Peoples Democratic Party (PDP) and former Commissioner for Culture and Tourism in Enugu State, on Saturday joined the All Progressives Congress (APC). The News Agency of Nigeria (NAN) reports that Mmamel completed his defection to the APC when he registered in his Agu Obowa Ward II in Ezeagu Local Government Area of the state. He was received by his ward Chairman, Mr Chidozie Uchenna, APC chairman in Enugu state, Dr Ben Nwoye and the party’s national Vice Chairman in the South-East, Chief Emma Enukwu. The former governor of the state under the platform of the PDP, Mr Sullivan Chime, was among the dignitaries who received Mmamel. Mmamel said his decision to join the ruling party at the national level was to attract visible development to his local government and the state in general. Mmamel, who was the first executive chairman of Ezeagu Local Government Council, said the area was in dire need of infrastructural uplift. Only two days ago, it was all black for Rihanna at the launch of her Jewelry line and on Friday, she went in the exact opposite direction and donned all white in the same ballgown style. 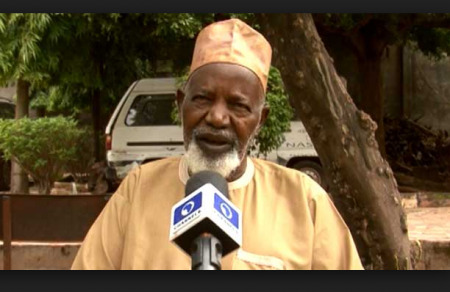 Former governor of Kaduna State, Alhaji Balarabe Musa, has said that Igbo people have not been treated as co-owners in the scheme of things in Nigeria. The second republic governor admitted that since the civil war ended, Igbo people have not been treated as co-owners of the country. He said: “Sincerely speaking, the South-East has not had a fair-share since the civil war. 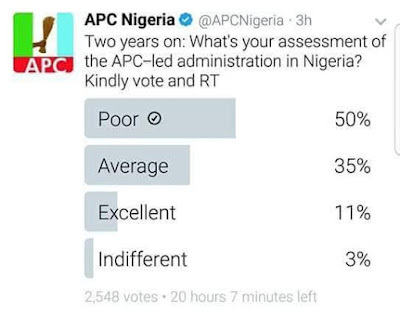 Their marginalization is quite obvious. “But if the policy of reconstruction, reintegration and reconciliation of Gen. Gowon and the late Gen. Murtala’s administrations had continued, the agitation by the few Igbo for Biafra state would have been a thing of the past. 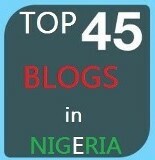 “It is the marginalization that is making a small section of the Igbo to agitate for Biafra. If the reconstruction and reconciliation had been sustained, there wouldn’t have been any need for Biafra because the number of those Igbo asking for Biafra is not more than 10 percent. Blac Chyna underwent a hair transformation and flaunted a short pink hairstyle in new photos..
Pippa Middleton and James Matthews have signed the dotted lines and are now legally a married couple. The newly weds were all smiles and looked so in love as they left the private ceremony at the church in Englefield hand in hand. Kate Middleton's younger sister Pippa, 33, yesterday morning arrived to St. Mark's Church for her wedding to James Matthews. She wore a wedding dress designed by Giles Deacon with a veil by Stephen Jones, a Maidenhair Fern tiara, and Manolo Blahnik ivory satin shoes. The popular comedian recently built a house for his mum in Benin and this is the inside of the massive home. The singer is now rocking blonde hair. You like? President Trump and his wife, Melania arrived in Saudi Arabia yesterday and were both welcomed at the Royal Terminal by King Salman. It's Donald Trump's first trip abroad since he became president in January 2017. Such an amazing story. When someone asked her why she mentioned his occupation, she replied: "Because security guards don't earn much and managed to take me to school". Actress Lupita Nyong’o was spotted with a man rumoured to be her new boyfriend at the Eden Roc Hotel during the 70th Annual Cannes Film Festival in Antibes, France on Thursday.. The tennis champ is 24 weeks into her pregnancy. Republic of Cameroon has despatched its navy war ship to Calabar, Nigeria. According to Dailytrust Newspaper, the ship arrived the Calabar waters at 12 noon complete with senior naval personnel, Cameroonian journalists and civilian dignitaries. 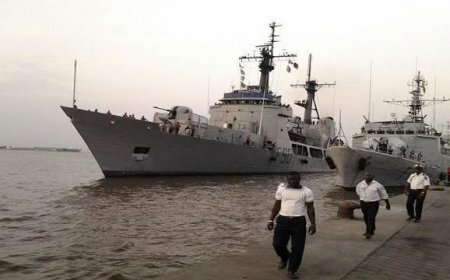 The Commander of Information at the Eastern Naval Command, Commander Abdulkadir said the Nigerian Navy authorities were yet to be formally briefed about the mission of the flag ship. The Ambassador of Cameroon in Nigeria was escorted into the ship where he received salutes from both Nigerian Navy and the Cameroon Navy personnel before he shook hands with his compatriot. Future Zahir Wilburn, son of Ciara and Nayvadius Wilburn (aka Future Sr.) turned 3-yr-old today. She and her husband/Future's stepdad, Seattle Seahawks quarterback Russell Wilson, celebrated him in posts on their Instagram page. Pretty lady taking care of the cows.. Governor Nyesom Wike spotted with his cute son, at Portharcourt pleasure park last night. Theodore can be seen in the video smiling and trying to put one foot in front of the other while his mother cheered him on. The adorable child wobbled a few times but his mom was there to hold him up. 10 years after competing against each other at the debut edition of MTN project fame, Big Brother Naija 1st Runner Up, Bisola and singer, Iyanya are back on the same team. Badgirl Riri showed off these beautiful high end jewelry, which she created in collaboration with Chopard. Rihanna Chopard collection! Rihanna looked stunning at the official launch event of her jewelry collection with Chopard. Here are lovely photos of former Super Eagles captain and striker, Daniel Amokachi, who has been elevated to the position of Technical Director of Finnish League side, JS Hercules. May God console her family and friends.. These photos are from her baby's dedication which held at a mosque in Toronto, Canada some weeks ago. Moji’s 20 year old first daughter, Adunoluwa is currently a 200 Level student of Babcock University. Former President Goodluck Jonathan was in Government House, Port Harcourt, on a visit to Governor Wike. They had a closed door meeting before Dr Jonathan left for another engagement at Okrika. Nollywood actress, Moji Olaiya, the daughter of legendary musician, Victor Olaiya, has sadly passed away. The 42-year-old actress who delivered a baby girl in March, died in a Canada hospital last night from possible complications from her child birth. Nigerian professional footballer, Asisat Oshoala, who plays as a forward in the Chinese Women’s Super league for Dalian Quanjian F.C., shared these photos of herself in a bikini while at the beach. The actress who is currently in Morocco went for a talk at the Education for All foundation in Morocco. King of night life, Shina Peller was a year older on May 14, 2017 and he had a week long celebration planned. Over the weekend, he hosted friends and celebrities to a special dinner party in Lagos and the turn up was lit. The party was attended by NFA president, Amaju Pinnick, 2face and Annie Idibia, Kcee, E-Money, Hushpuppi, Swanky Jerry, Lil Kesh and several others. Nicki Minaj shared these beautiful photos of her mum, Carol Maraj. Actor, Brad Pitt, who has been having a difficult time since his split from estranged wife, Angelina Jolie, about 8 months ago, stepped out in New York City on Tuesday for the premiere of his new Netflix movie, War Machine. He looked better than he had been in the recent past. In these new photos,Tboss remains her attractive and pretty self while Bisola represents the typical African woman with her dark and beautiful skin. The 2017 Big Brother Naija second runner up, Tokunbo Idowu popularly known as TBoss was among the distinguished guests at the the book launch of Senator Dino Melaye in Abuja on Monday. Ghanaian actress and mother of two break-dancing during the pregnancy of her twin babies. The 44yr old actor who has been tipped for the role of James Bond was at his suave best in these campaign shots for drinks brand, Purdue's. The ex big brother Naija housemates spotted as they stepped out for an event in Port Harcourt over the weekend.